I mentioned Gore Vidal's series of historical novels in my first post. The recordings I did are long out of print, but if you enjoy historical fiction, delivered with a gimlet eye and healthy dose of (mostly cheerful) cynicism, you should pick up this series for summer reading. Burr is excellent, and the later novels spin out the family saga sub-plot in a clever way, but Lincoln is the jewel in this richly figured crown--probably one of the best historical novels of the last century. The author's fondness for his subject is obvious on every page. His portrait of Lincoln is deeply affectionate and fully fleshed out. You feel you get to know Lincoln in a way few other novelists or biographers have managed. 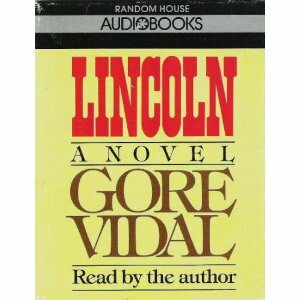 Whenever I read a book about Lincoln these days, I can't help picturing Gore Vidal's Lincoln, a complex, humorous and immensely loveable figure. What I never knew until I scouted around on Amazon looking for a copy of my old recording, is that Vidal himself recorded an abridged version for Random House. You can pick one up for as little as $4. I imagine the entertainment value would be well worth the price--plus the trouble of digging out an old cassette player to hear it.